Downtown Moscow, across from the Kenworthy. back entrance to the big parking lot off Jackson Street. As a family owned business, we have been providing sales, servicing and repair of bicycles and ice skating equipment for 20 years. 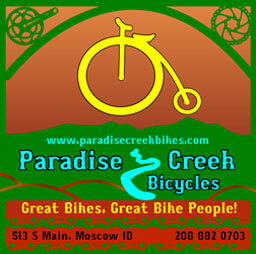 We have the philosophy that our business is to actively engage the smiles that come with the lively communities nestled among the rolling hills of the Palouse that participate in the safe and healthy lifestyles of cycling and hockey.